There are good reasons that the Piper Archer is found at so many flying clubs and schools, yet still finds a home as an airplane people will actually own for their personal use. Its stable flight characteristics and simple design make it an excellent trainer. And with enough speed to get you where you want to go, but not too much to get you in trouble. The Archer became the Archer II with the new designator PA-28-181 in 1976, when a semitapered wing was introduced. It, in combination with the low-drag wheel pants that became available a couple of years later, significantly increased the cruise speed and decreased the stall speed. The new design was so good that it remained essentially unchanged until 1995. Simplicity is a word that comes to mind when stepping into the Archer. And in this case, simplicity is a good thing. Switches, buttons and controls are large and conveniently placed. The flaps are manually engaged with a Johnson bar located between the two front seats. There are three notches providing 10, 20 and 40 degrees of flaps. The cockpit layout is slightly reminiscent of reading a book with large text versus one with smaller font. The convenience factor makes it easier for the reader and, in this case, the pilot. 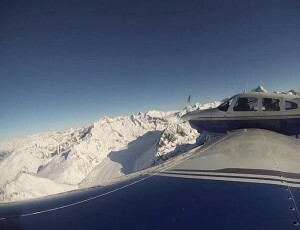 Alpine Flight Training utilizes the Archer II primarily for Mountain Flying, and Instrument Training however we also provide Private Pilot primary training in the Archer for those that desire to learn in a larger airplane.